Enjoying this App? Leave us a review and we’ll reward you with 100 In-App Purchase coins! Remember years ago when you would go into the local store to purchase a new game or software, purely making your decision on friends recommendations, box art, details on the back of the box, or even the cashiers suggestions? These days, buying a game or program based off of what the box or store cleric says about it sounds archaic, now days you’re able to view hundreds if not thousands of reviews online or in app stores. With the advancement in technology and review sections in things like the App Store or Google’s Play Market, you’d think we’d have a good success rate of only buying apps that we’ll likely enjoy or get good use out of, unfortunately though, it seems these days it’s much too common to purchase an app only to find it’s nothing like you thought. So why is this? Why even with the incredible amount of reviews and feedback we have right in front of us prior to purchasing or downloading, is it still difficult to choose apps you’ll be happy with? Well, I believe there are multiple reasons for this, and just to clarify, this article is specifically directed towards the Apple App Store and Google’s Play Market. First I’d like to cover some of the reasons why I think we get such poor reviews and feedback with mobile apps and then I’m going to go over some ways that you can help reduce the amount of poor reviews left for mobile apps. If you didn’t understand the header of this article, this section should help explain it. One of the biggest annoyances I see in mobile apps today, and I think many of you can agree, is the bait & switch maneuver that developers try to pull to get good app ratings. This is where a developer will prompt a message in their app shortly after you start using it, specifically short enough that you haven’t even had time to really use the app much. Often times, especially with mobile games these messages will offer some time of reward for giving a review and even worse a reward if you rate the app 5 stars. I have seen some apps where this type of message doesn’t pop up until hours of using the app, which is a completely acceptable thing to do, but it’s also rarely seen. Generally developers will put the most work into the first 20 minutes to an hour of using a app, then have people rate it right before they start to see all of the flaws. This becomes a huge issue, because it results in many bad apps climbing to the top of the charts because of tricking or bribing users into giving the app a good rating. How to help fix the issue? Simply by not falling into these traps, I know the 100 gems being offered to you is extremely tempting to give that game a 5 star review, but trust me it’s never worth it. Chances are, if they’re offering free in-app currency for giving them a good review, it’s not going to be enough of a bonus to make it worth your while. Unfortunately in many cases, apps receive either terrible reviews or untrue praises simply because someone wants to pull the strings. There really isn’t any way to get around these type of reviewers other than just using your best senses. People will always try to cause trouble by posting misleading information to ruin someones day, why anyone gets a kick out of this is beyond me. At the same time, I don’t know why I thought prank phone calls were really that funny when I was a kid either. If you’re unsure what a internet troll is, Google’s define feature describes it like this. The only thing you can do, is do your best to not post misleading or untrue information. Usually these types of reviews aren’t really all that clever, so if you think something sounds off or fishy, it probably is. One thing to remember when scrolling through the reviews on a specific app, is that not everyone posting the review is going to be unbiased. In the best cases you may see reviews from the developers themselves or from their friends and family, in the worst cases the developers are using bots and scripts to post glorified reviews. The same can be done to trash the competition by submitting negative reviews over and over. Like dealing with internet troll reviews, with these you often have to use your best judgement to spot a fake. Here are a few tips that can narrow down a good review. Does it sound like a person wrote the review or a auto-generated message? Have you seen the exact same response on other reviews? You might argue the point that some of those types of reviews are legitimate, and yes you’re probably right, but unless someone provides specific details to their review, their credibility really doesn’t count for much. This isn’t to say that every review on the App Store or Play Market needs to be some long novel either. Next we’ll go over some good pointers to consider when reviewing a app. The primary key in reviewing a app is to provide specific enough detail to allow whoever reads it to find value in the review. It doesn’t necessarily need to be long in-depth details either, it just needs to have enough detail so that whoever reads the review can make a better choice on whether or not to download the app. Over the next few sections, I’ll quickly go over a few do’s and don’ts for specific situations. To me these are the utmost important reviews, good reviews are great and they help developers succeed in getting their app out there, but negative reviews are what helps us separate the good from the bad. For example, I love the game Bardbarian, but you might not, hence me leaving a great review about it, doesn’t mean that you’re going to love the game. On the other hand, if the game was unplayable or tried to scam you out of money we could both agree that the game deserves a bad review. So here it’s important to note, that if you don’t like a app or game because it’s not really your thing, than it’s important to stress that in your review. 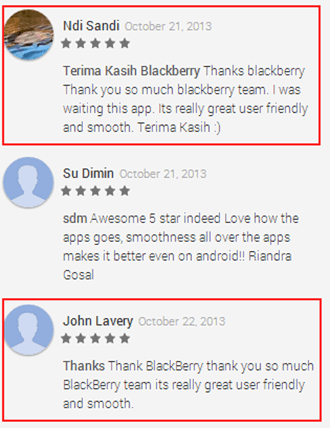 Here’s a few examples of a helpful negative review and a unhelpful negative review. Those are just a few examples and I’m sure you’ve seen plenty of reviews like the ones listed as not helpful if you’ve ever browsed reviews on the App Store or Play Market. Another key thing to keep in mind about technical issues, is that often times those issues can be resolved if you first contact the developers rather than run to the review section to give them a 1 star rating. Very rarely will you not get a response back from developers that are current with their app, you have to remember that most of these developers want their app to succeed and will usually do what they can to help your situation. I’ve had countless times where I’ve experienced lost progress or crashes within a app and had the issue resolved by contacting the developers directly. If you’re not going to contact the developers or they won’t respond to you, remember to add device information into your review. The app may not work on a HTC One with Android 4.2, but works perfectly on a Samsung Galaxy S3. Whenever leaving a negative review due to technical issues, it doesn’t help anyone unless you provide enough specifics for the reader to know if it would even effect their device. If you’ve ever found a app that has made your life simpler or easier to manage, or a game that you just love to play, chances are you’d like to share your positive experiences with others. Positive reviews are crucial to a app or game becoming successful, so if you’ve found something that’s worthy of praise, then you should take the time to thank the developers by leaving a positive review for their app. However, even though you’re leaving positive feedback, it’s still important to follow the same rules as leaving a negative review. The app may work wonderfully on your device, but may have major inconsistency issues on another, and as I mentioned above, just because you love the app, doesn’t mean everyone else will. Provide some specific information about why you enjoy the app and you’ll help others experience the same joy you did when you discovered your favorite app. I could easily go into much more detail, especially considering my position, but what I really wanted to help get across was that when leaving a review, remember to provide some specific detail. Hopefully the more people who provide better and more accurate reviews, the better apps and games we’ll see on our mobile markets. Remember, if apps that deserve a bad rap get reviews that turn people away, then that will discourage developers from releasing poorly made apps. The same goes for good apps, don’t let good apps die on the market because they’re filled with un-detailed 1 star reviews. Apple has updated the App Store to now include the option to choose App Support when viewing the review screen. 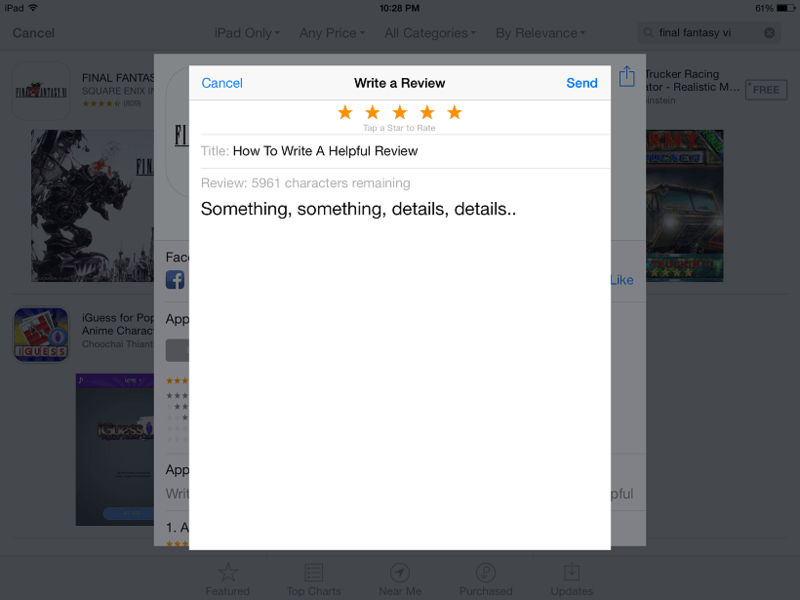 This option has been placed right next the option to Write A Review. Hopefully this will encourage people to try and get support from the developers prior to bashing their app with a nasty review. All in all though, I hope this article has helped some of you collaborate better ways to not only write more helpful reviews, but also spot untrustworthy reviews. I’d love to hear what you think about the article or even if you have something to add, please be sure to leave your responses in the comments below. You can also like our Facebook page, follow us on Twitter, and add us to your circles in Google+ to keep yourself up to date on all things mobile.